This unique cat is found in southeastern Asia from Nepal to Indochina, Sumatra and Borneo. Although its name may suggest otherwise, the clouded leopard isnt related to the leopard nor any other species of cat. It can not purr like small cats, and it doesnt have a loud roar like the big cats. 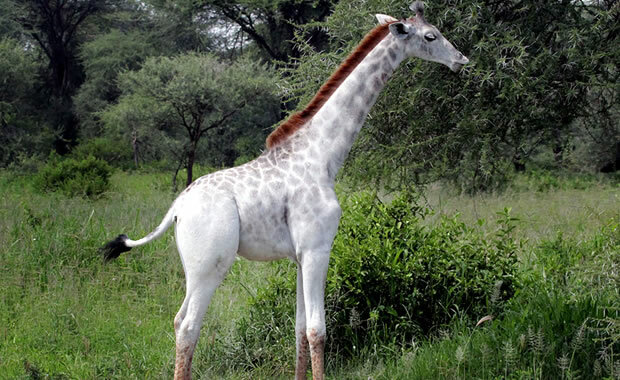 Its coat can appear pale yellow to brown and has distinctive cloud-like markings with brown to black blotches on the edge and paler markings in the middle. Its tail is long and heavily furred and has black rings. Adults can weigh up to 45 lb and can grow up to three feet in body length. The clouded leopard has the longest and sharpest teeth of all cats. The clouded leopard prefers evergreen tropical rainforest for its habitat. It has also been found thriving in secondary and logged forest, grassland, scrub and mangrove swamps. Clouded leopards prefer to rest in the trees and to hunt prey (day or night) by either stalking the prey on the ground or through an ambush from the trees. Diet consists of deer, wild boar, monkeys, and other small mammals. Little is known about the clouded leopards reproductive behavior in the wild, but in captivity the female gives birth to one to five kittens after a gestation period of 93 days. The latest estimated population of the clouded leopard is about 230 individuals in the wild and a little over 100 in captivity. Cause of decline is excessive hunting for its fur, teeth, and bone, and loss of habitat due to deforestation. Clouded leopards are found in parks and reserves, and there have been attempts to breed them in captivity, but they have generally been unsuccessful. The species is legally protected in the wild. Copyright Notice: This article is licensed under the GNU Free Documentation License. 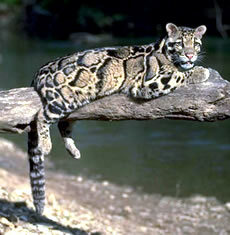 It uses material from the Wikipedia article "Clouded leopard". Glenn, C. R. 2006. "Earth's Endangered Creatures - Clouded Leopard Facts" (Online). Accessed 4/20/2019 at http://earthsendangered.com/profile.asp?sp=236&ID=3. Need more Clouded Leopard facts?